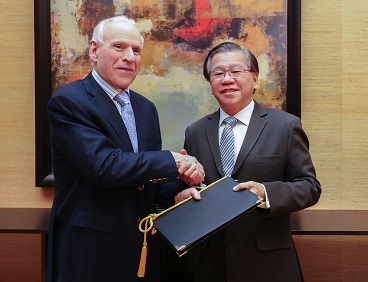 LOS ANGELES (FEBRUARY 16, 2017) AND SINGAPORE (FEBRUARY 17, 2017) – Mapletree Investments Pte Ltd (“Mapletree” or “the Group”), a leading real estate development, investment and capital management company, is pleased to announce that it has acquired Oakwood Worldwide (“Oakwood”), a premier global provider of corporate housing and serviced apartment solutions. The acquisition covers all of Oakwood’s global operations. Mapletree also wishes to announce the appointment of Mr. Christopher Ahearn as Oakwood’s Chief Executive Officer (“CEO”) with immediate effect (please refer to the Annex for Mr. Ahearn’s biography). Oakwood’s Founder and Chairman Mr. Howard Ruby will assume the non-executive role of Chairman Emeritus at Oakwood, where he will serve in an advisory role to Oakwood on the corporate housing business. Mapletree’s acquisition of Oakwood is part of its long-term strategy to strengthen its corporate housing and serviced apartment business. Currently, all of Mapletree’s nine corporate housing and serviced apartment assets in the United States (“US”) and Australia are managed under the Oakwood brand as part of a collaboration signed in 2014. The collaboration also saw Mapletree acquire a 49 percent stake in Oakwood’s Asia Pacific operating arm, Oakwood Asia Pacific. Said Mr. Hiew Yoon Khong, Mapletree’s Group Chief Executive Officer: “This acquisition is strategic and commercially significant to Mapletree. Our full ownership of Oakwood will allow us to enhance efficiencies and the growth momentum of our corporate housing and serviced apartment business. In addition, Oakwood is a reputable global brand and we intend to continue strengthening its presence. Mr. Ahearn, as Oakwood’s new CEO, will draw from his vast experience in growing and improving the operating performance of companies, which he gained while serving as Senior Advisor to TPG Capital. He will also capitalise on the industry knowledge he acquired while serving as Oakwood’s Senior Vice President of Sales and Marketing from 2005 to 2010. Oakwood is the largest provider of corporate housing and serviced apartments globally with a presence in more than 95 countries. The company serves more than 80 percent of Fortune 500 companies, and works with the 10 largest US relocation companies. In addition to a vast supply chain inventory, Oakwood manages a portfolio of more than 50 branded properties globally. In addition to the nine Mapletree properties operated by Oakwood (US and Australia), Mapletree is currently developing three serviced apartment properties in Japan and Vietnam as well as one other asset under development in the US, which will be managed by Oakwood Worldwide upon completion. Mapletree is a leading real estate development, investment and capital management company headquartered in Singapore. Its strategic focus is to invest in markets and real estate sectors with good growth potential. By combining its key strengths as a developer, an investor and a capital manager, the Group has established a track record of award-winning projects, and delivers consistent and high returns across real estate asset classes. Mapletree currently manages four Singapore-listed real estate investment trusts (REITs) and five private equity real estate funds, which hold a diverse portfolio of assets in Singapore and Asia Pacific. As at 31 December 2016, Mapletree owns and manages S$38.6 billion (~US$26.6 billion) of office, retail, logistics, industrial, residential, corporate housing and serviced apartment, and student housing properties. The Group’s assets are located across 12 economies globally, namely Singapore, Australia, China, Germany, Hong Kong SAR, India, Japan, Malaysia, South Korea, the United Kingdom (UK), the United States (US) and Vietnam. To support its global operations, Mapletree has established an extensive network of offices in Singapore, Australia, China, Hong Kong SAR, India, Japan, Malaysia, South Korea, the UK, the US and Vietnam. In the US, Mapletree currently owns a portfolio of seven student accommodation assets located across six states, and eight Oakwood-branded corporate housing properties with more than 1,200 units. The corporate housing properties are situated in Silicon Valley, Raleigh, Los Angeles, Portland, Dallas and Seattle. 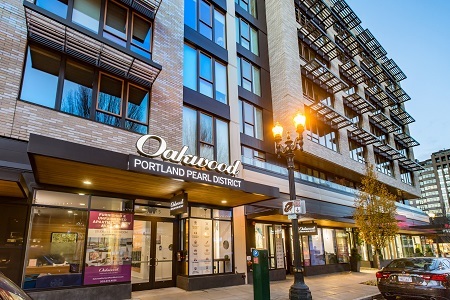 Oakwood Worldwide® is the premier provider of corporate housing and serviced apartment solutions through its well-known brands, Oakwood®, ExecuStay® and Insurance Housing Solutions™. With a presence in all 50 United States and more than 95 countries, the award- winning company provides move-in-ready furnished accommodations to meet the needs of global organizations, individual business travelers, insurance clients and leisure travelers alike. Oakwood Worldwide was founded in and continues to base its corporate headquarters in Los Angeles and operates regional headquarters in London, Phoenix and Singapore. For more information, please visit OakwoodWorldwide.com. Mr. Christopher Ahearn has more than 26 years of experience in the areas of consultancy, sales, marketing and operations across a broad range of industry sectors. In his last appointment, Mr. Ahearn was Senior Advisor for TPG Capital and worked on a variety of projects spanning multiple industry sectors to improve the operating performance of companies acquired by TPG Capital. Prior to that, Mr. Ahearn was Senior Vice President of Sales and Marketing for Oakwood Worldwide from 2005 to 2010. Mr. Ahearn has also held executive roles with FedEx Office, NowDocs and RR Donnelley, and worked with corporate boards and partnered with senior executive peers to drive initiatives that delivered improved business performance. Mr. Ahearn holds a bachelor’s degree in Marketing from California State University, San Bernardino, the US.